We have congratulated you upon winning the Pulse of the City News Customer Satisfaction Award — who should you be congratulating and thanking? Customers, employees and referral sources! Don’t forget the people that got you to the party! And don't for a minute let them think you may take them for granted! 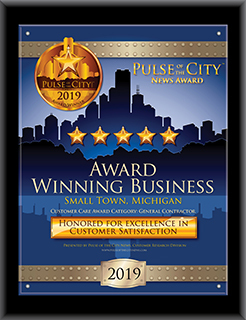 Use the Pulse Appreciation Package materials to thank individual customers with their own personalized certificate or plaque delivered to them or presented by you, and/or thank your customers generally with the standard tribute to customers certificate or plaque mounted where all will see it. You know that your great employees serve those same customers, and their customer service orientation can make or break you. Show your appreciation and underscore the importance of customer service by thanking them on the occasion of the company’s distinguished award. You can select from a full-color, 8.5” x 11” Certificate of Appreciation or a 10” x 13” blackwood-plaque-mounted-and-framed certificate, either of which is available customized with the recipient's name (individual, company or both) and title, project name if applicable (or other message you wish), and your company’s name listed as the Award winner and the presenter of appreciation recognition to your recipient. Or use this opportunity to express your appreciation to your staff for their success providing customers with an excellent experience. Present them with a Certificate of Appreciation or Plaque, with personalization you select if desired. Don’t forget your referral sources! They put their relationship on the line with their friends, colleagues or customers when they recommended you! They obviously think very highly of you, but don't forget that there are plenty of competitors that would love to have the benefit of their referrals. A meaningful and tangible record of your appreciation tells them you prize their trust in you to take care of who they refer to you, and reassures them that you are the type of businessperson who takes care of important relationships. And it is a subtle but effective way of informing them of your award status, which cements their comfort in referring you again and again.